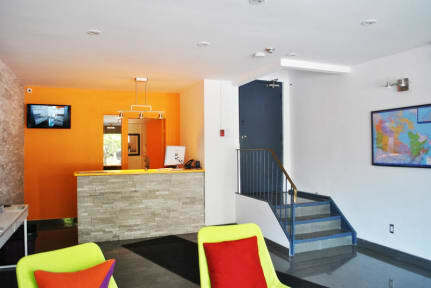 Our building at College Backpackers has recently undergone extensive renovations. 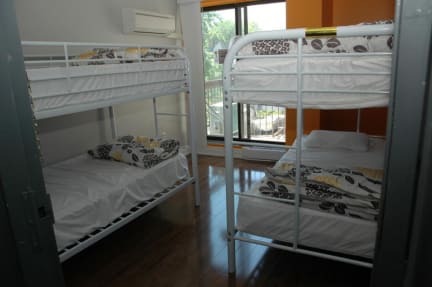 The College hostel specializes in providing low cost, clean, comfortable private rooms for travelers or students visiting Toronto. We offer the best value for single overnights, weekly or monthly accommodation. Free WiFi is available. At Kensington Market you and your friends are literally just meters away from affordable food and fun. Set yourself down for drinks and sip fancy cocktails while listening to live DJs spin some tunes at a local club. If you are looking for accessories and vintage clothes, there are plenty of places to shop. And for a break from the busy city streets, take a stroll around the University of Toronto campus, which is a sight on its own right. The area is surrounded by Restaurants and pubs. Public transport is steps away. For dorms fresh linen is provided at check-in and every guest has a private dedicated locker to store their valuables. All rooms have wooden flooring, heating and air conditioning and private balcony. Please provide your CVV code at the time of booking.Through your booking or by emailing us (collegehostel1@gmail.com) with your booking number and last name. This property pre-authorise your card before arrival. A 20 CAD refundable key deposit is required at the time of checking in. Smoking is strictly prohibited throughout the hostel premises. O Hostel é bom, localização muito boa, limpo e com internet de qualidade. Coisas que acho que poderiam melhorar: - cortina nos quartos: no verão amanhece muito cedo e anoitece muito tarde, isso atrapalha bastante a qualidade do sono de quem não está na cidade passando férias, sim a trabalho ou estudo; - horário do café da manhã: café da manhã começa a ser servido as 8am, se você está estudando/trabalhando na cidade, como foi o meu caso, provavelmente não vai "desfrutar" do café da manhã. O atendente do dia 11 reteve CAD 20,00 pela chave entregue. Disse que o valor seria devolvido na saida mediante devolucao da chave. As 8h do dia 15, ocasiao da saida nao havia ninguem pra receber a chave e devolver o valor, portanto houve um prejuizo de CAD 20,00. Qual solucao para o caso ?? Nao achei o ambiente muito acolhedor comparado a outros hostels que ja estive. Na rua do mesmo existem muitos homeless. O ralo do banheiro feminino estava entupido. Eu tomando banho e a agua subindo e cobrindo meus pés. I went in for check-in and the staff barely looked to my face. The room was dirty and didn't have enough space to organize your things. One of the power plugs was kinda broke. The washroom do not have space to put your things. No paper towels in the bathrooms either. The flush was broken and they take a while to fix it. The kitchen was good and the breakfast very simple but ok. The location is good, but I did not felt safe all the time. Not worth the suggested price !! !